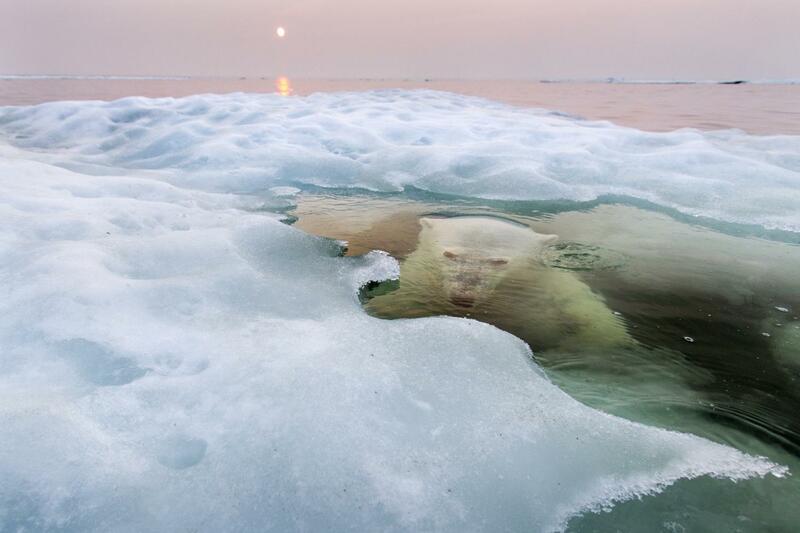 The Water Bear picture of a polar bear by Paul Souders which won the category Animals In Their Environment – Wildlife Photographer of the Year 2013. Happily I managed to go to the Wildlife Photographer of the Year exhibition yesterday at the M Shed in Bristol. (more info about Bristol exhibition here) and I was very impressed, in fact it was a total joy. The M Shed worked well as a venue for the exhibition. It’s in a fairly large room split into about 6 sections, and has some distractions in the middle for children to do, Including a Snail Trail, which was appreciated by our children, although the two year old was more interested in a button which made a shrieking fox noise to the whole room! As you’d expect from the photography it’s of a very high quality, the one image which several of us all absolutely adored was of a polar bear submerged just underneath the ice. Here’s a write up about taking that picture from the photographer (scroll down). This photo took me by surprise and actually left us pondering that the photos which stand out tend to be the ones which show us a view of the world which we’ve never seen before. I looked into the work of the polar bear photographer Paul Souders, and he has a beautiful website which has many many jaw dropping wildlife photos on – have a look here. Here’s another picture which I absolutely loved… again it shows us something which we don’t normally see. I was particularly taken with the complicated patterns created by the trees etc. Richard Packwood: The Greeting. Currently showing in the Wildlife Photographer of the Year exhibition in Bristol. One good thing with this exhibition, in comparison to other more abstract exhibitions, is there’s a much higher chance of children walking around with you and discussing the photos, this accessibility really made it for us. Even lightly discussing the images which cover the negative side of the animal world – hunting and damaging the environment. Anyway, the exhibition is on until 23rd February, so do go, and then tell me what you think of it! p.s. just as a little final link to share, this French website seems to have collected lots of photos of polar bears, it might make you smile.